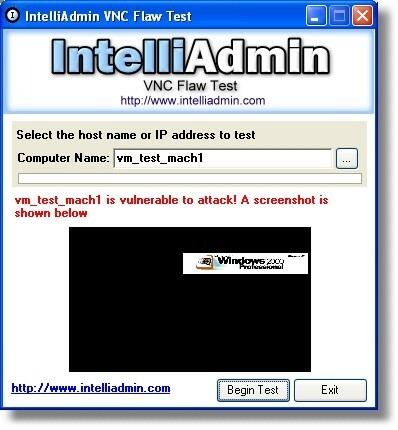 VNC Flaw Test 2.0 is remote computing software developed by IntelliNavigator, Inc. This program allows you test your installation of VNC for the password bypass vulnerability. It will show you a screenshot of the remote host if you are vulnerable. This remote computing software is freeware, which means you can download and use VNC Flaw Test 2.0 absolutely free. There's no need to buy the product. VNC Flaw Test 2.0 supports English interface languages and works with Windows XP/Vista. We have tested VNC Flaw Test 2.0 for spyware and adware modules. The software is absolutely safe to install. We has completely tested remote computing software VNC Flaw Test 2.0 many times, written and published the interesting article and uploaded installation file (987K) to our fast server. Downloading VNC Flaw Test 2.0 will take several seconds if you use fast ADSL connection. Undim can be useful if you want to take a screenshot of a remote Mac; ordinarily, if the screen is asleep, a screenshot will yield only an empty file.